Part topiary, part trellis, part English garden these shutters that I consider the best green shutters ever are on a charming home in Provincetown, MA. The vines are well established and upon closer inspection I could see the original once painted green shutters beneath the ivy. Each plant was placed with the end design in mind so the vines head straight upward to each shutter. I’m not sure how you would make this work for a two story home but on this single story home I think it is just absolutely brilliant. The homeowners wisely chose a soft olive green to paint the front door. 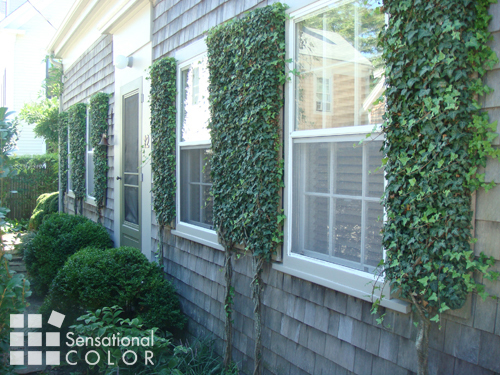 The color works perfectly with the natural green hues in the ivy without competing or drawing too much attention. If you are a regular reader of this blog you know that comment flies in the face of what I ordinarily recommend because I like the front door to be the focal point of the facade. 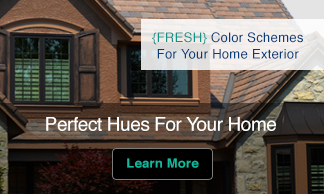 In this case however I’m giving these homeowners a green thumbs up for their color choice. 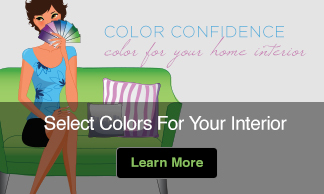 Do you love the way this home looks as much as I do? 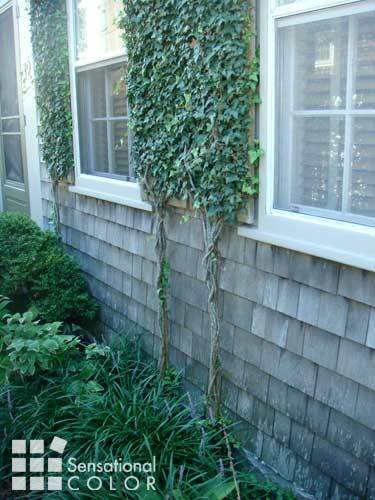 Makes me think of Peter Pan 🙂 The ivy matches the shingled siding beautifully! Oh, how I miss living up north! Very whimsical AND pretty… these folks have sense of humor AND style! I’m trying to figure out how I can do this on my own house- it’s brilliant! Yes, whimsical is a good word to describe these shutter. As is the reference to Peter Pan. I agree these are very ‘storybook’ cute!